If it's a WWDC keynote, there will be numbers—lots of numbers—designed to demonstrate Apple’s continued might in the mobile and PC markets. 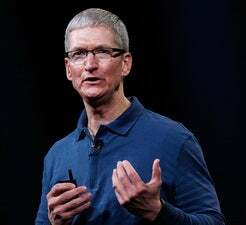 So for example, Apple CEO Tim Cook crowed that iOS 7, which debuted at last year’s show, is now installed on 89% of all iOS devices in existence; by contrast, he pointed out that just 9% of Android devices are running the latest version of the Android operating system. 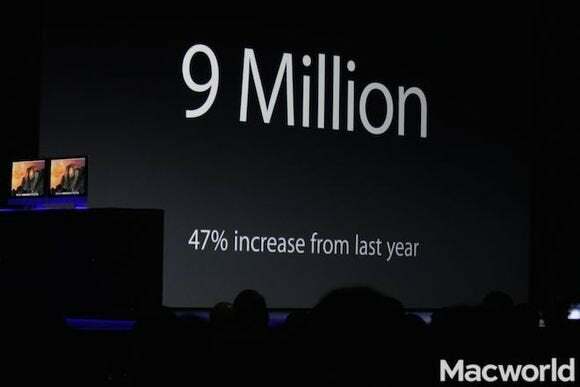 "We've now sold well over 800 million iOS devices," Cook said. The iPad has passed 200 million units, the iPhone 500 million units, and the iPod touch 100 million units. More then 130 million customers who bought an iOS device in the last 12 months were buying their first Apple device. "Many of these customers were switchers from Android,” Cook said. “They bought an Android phone...by mistake...and then had sought a better experience...and a better life. And decided to check out iPhone and iOS." iOS 7 earned a 97% overall satisfaction rating from its users. 98% of Fortune 500 companies now use iOS. "And we're going to get the last two." 300 million people visit the App Store each week. There are now over 1.2 million apps in the App Store, and over 75 billion apps have been downloaded in total. While PC sales were down 5% in the last year, Macs grew by 12%. The Mac now has an installed base of 80 million units. Over 50 percent of Mac users on the latest version of the Mac OS. (By contrast, Cook pointed out, Windows 8 is on just 14% of PCs—despite being available for a year longer. "Need I say more?" Cook asked with a smile. There are 1,000 engineers at WWDC from 69 countries. 70% are at WWDC for the first time. The youngest developer at the conference is just 13 years old. "The developer community is incredibly vibrant,” Cook stated, “We now have 9 million registered developers. That's up almost 50% over last year."